Normal for fans to go nuts while charging? Discussion in 'Roadster' started by asgard, Sep 10, 2013. The fans on my 1.5 roadster go crazy while charging in my garage. It is pretty warm - around 80F in the garage. Is this normal? Yes that's normal for the fans to operate like that.... this is part of the normal charging cycle, its cooling down your battery pack down. the fans pulling the hot air from the pack through the HVAC system and condenser. Also the rear blower will turn on to help cool down the motor/pem. 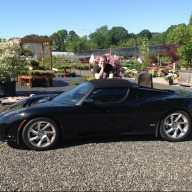 Yep, the Roadster makes a huge racket when charging. Model S is much quieter! Now it's just old hat. I read somewhere that you can no longer commit suicide with the newer cars in a garage because the carbon monoxide is pretty much removed before the exhaust leaves the tailpipe. I can confirm this through first-hand observation! There was NO evidence of any foul-smelling gasses! CO is odorless and deadly. You should have opened the garage door for a couple of hours just to be safe. You don't get CO normally; you get CO2. You get CO because the oxygen starts running out and the gas can't burn completely. Maybe modern cars have sensors that help prevent CO poisoning, but I sure wouldn't take that chance! Mine runs like a hover craft the entire time it's charging. I'm in an enclosed highrise garage and it's usually whisper quiet in there (unless someone is coming/going). . . Not any more while I'm charging. It was a little distressing for me to have that many moving parts on the vehicle so often (room for parts to break if they're moving in my mind). But that's the way it is. Once it's charged up, it'll settle down. Until you use it again and those fans kick on full-time again! I also discovered the 1.5's are allot quieter than the 2.x's when charging and the front fans don't run as often as well as the rear blower.... once the pack's temp has been driven down its pretty quiet. Thought I'd say this before Brianman does. Fans go nuts whenever they see the car. It doesn't even have to be charging.